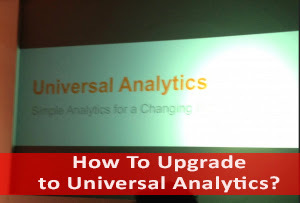 How To Easily Upgrade To Universal Analytics? Google Analytics is a widely used analytics program used to monitor user interactions and behaviours. The Google Analytics team is always trying to bring out the latest and improved features, which is what makes it the best Analytics program for webmasters. In fact, a lot of new changes were introduced in this year's Google Analytics Summit, and they include the all new integration with Universal Analytics. Universal Analytics was launched last year, and is a technology that allows you to measure customer interactions across platforms and devices. It is the new operating standard for Google Analytics. 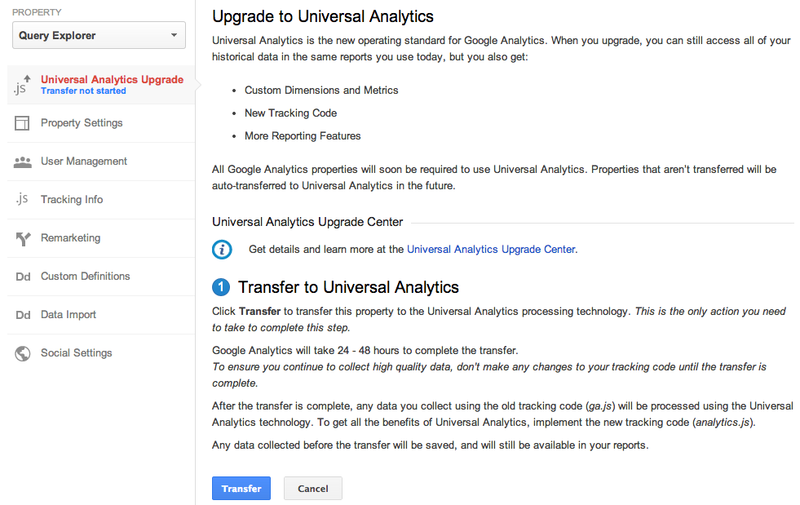 And Google has just announced the Universal Analytics Upgrade Center, an easy, two-step process to upgrade your existing properties from classic Google Analytics to Universal Analytics. As mentioned, Universal Analytics is the new operating standard for Google Analytics. The focus here is on the fact that when you upgrade to Universal Analytics, your existing historical data such as reports will be preserved, and you will see and use them in pretty much the same way you do now. But apparently, you also get some additional Universal Analytics features, which include custom metrics and dimensions, a new, simplified version of the tracking code, and better cross-device and cross-domain tracking support along with more reporting features. The upgrade process is really simple. The Upgrade Center handles the transfer of your Google Analytics properties to Universal Analytics properties. In your Property Settings, you might see a tool labelled Universal Analytics Upgrade. If you don't see it, then that's okay too. Much like Facebook's Graph Search, this feature is still being slowly rolled out to individual accounts. So you might see it in the coming days, or maybe weeks. If you already have the tool available, you can go ahead and Transfer. After the transfer is complete, you just have to add the new tracking code into your website's source, and you're all done! If this feature doesn't seem to appear for you after a few days or even weeks, then do not worry. The Google AdSense team is trying to enable Universal Analytics for all Google Analytics properties. Soon all Google Analytics updates and new features will be built on top of the Universal Analytics infrastructure. 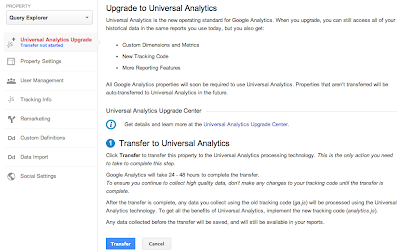 To make sure all properties upgrade, Classic Analytics properties that don’t initiate a transfer will be auto-transferred to Universal Analytics in the coming months.